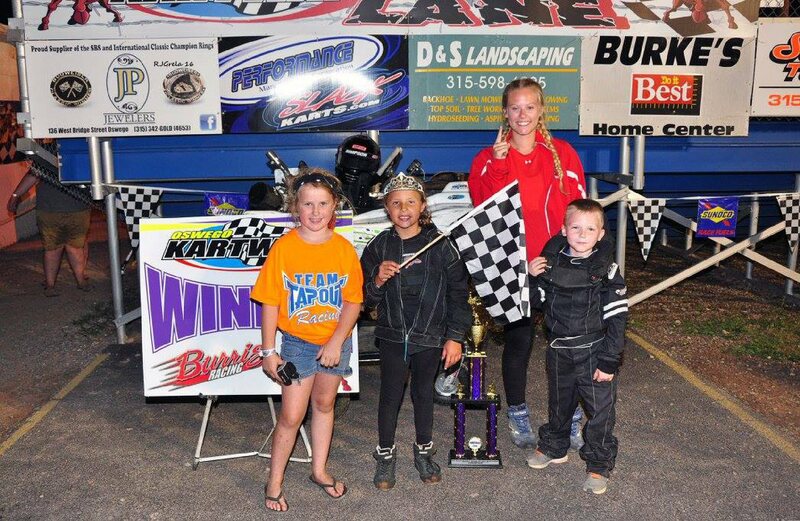 Emma Spaulding drove to victory in Jr. Green Clone on Friday night at Oswego Kartway to become 'Queen' of the Kartway. OSWEGO, NY – The first of Oswego Kartway’s Triple Crown events took place last Friday with the annual running of the RJ Kart Sales King of the Kartway championship. Emma Spaulding drove to victory in Jr. Green Clone on Friday night at Oswego Kartway to become ‘Queen’ of the Kartway. 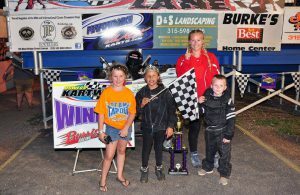 At the end of the night it was young Emma Spaulding upstaging the boys in Jr. Green Clone to earn the only ‘Queen’ of the Kartway title during the evening as she outran Jason Parkhurst and Cole Combes for the win in the No. 16. The victory for Spaulding was her fourth of the season, as she continues to be locked in a tight battle with Parkhurst and Combes for the Kartway track championship. Other junior division King of the Kartway champions on Friday were Tucker Fenske (Jr. Novice Clone), Logan Crisafulli (Jr. Purple Clone), Jacob Hutton (Sr. Green Clone), Griffin Miller (Jr. Blue Clone), and Jake Holmes (Sr. Blue Clone). In the senior divisions Eric Raponi continued his hot streak in Clone Heavy, driving away to the King of the Kartway title over Joe Hayden and Ross Spilman, to earn his sixth win of the season in the No. 83. In Clone Medium, rookie racer Thomas Montgomery scored his second but most important win of his career beating out point leader Trevor Bellinger and Dave Demling to be crowned King of the Kartway. Other senior division King of the Kartway championships included Ricky Prtichard (State Clone Heavy), Jamie Shutts (State Clone Light), Paul Fountaine (Masters), John Trenca (Clone Light), Shannon Pitcher (Clone Super Heavy), and Zach Mooney (Stock Medium). Drivers in as many as 15 different divisions of racing are expected to again turn out on July 22 for the next round of the Kartway championship trail. Young racers aged 5-15 will be separated between the junior divisions at the Kartway including Jr. Green Clone (5-7), Sr. Green Clone (7-9), Jr. Purple Clone (9-11), Jr. Blue Clone (10-12), and Sr. Blue Clone (12-15). Those drivers ages 15 and up will compete in either Clone Light, Clone Medium, Clone Heavy, Clone Super Heavy, Masters, Stock Medium, State Clone Light, State Clone Heavy, Champ Kart, or Open. Pit gates will open for competitors beginning at 4:30 p.m. Driver registration will close at 6:15 p.m. with the drivers’ meeting at 6:30 p.m. and hot laps to follow immediately after at approximately 6:45 p.m. Racing will start at 7:30 p.m. Entry fees for Kartway members will be set at $15 while non-member entry fees are $18. Pit passes will also be available for those not in competition for just $10. Friday night’s racing program will see heat race lineups determined by three-week points handicap with feature lineups set by heat race finish. As always spectators are welcome to come to the Kartway and enjoy the racing action. A full service concession stand is open, with limited bleacher seating. Fans are encouraged to bring their vehicle and park along the racing surface for a great view of the action. Admission for fans is only $5 per car load. Kartway events run May through September on most Friday nights, culminating with the Fall Frenzy 200 Championships on September 24. You can follow the Kartway on Twitter @OswegoKartway or like on Facebook at www.facebook.com/OswegoKartway. To speak to a Kartway representative call the Oswego Speedway box office at (315) 342-0646.